If you ever spend a humid night walking around the American prairie, you might run into one of these. It’s a prairie crayfish, and it and all of its friends have been living under your feet. We see crayfish in rivers and streams. They need to keep their gills wet to survive. But they’ve become adept at seeking out water everywhere. This is why the prairie crayfish can tunnel down into the ground, until they reach the water table. They form tunnels that can get up to six feet deep. Mostly they inhabit these tunnels alone, but during mating season males and females will get together. 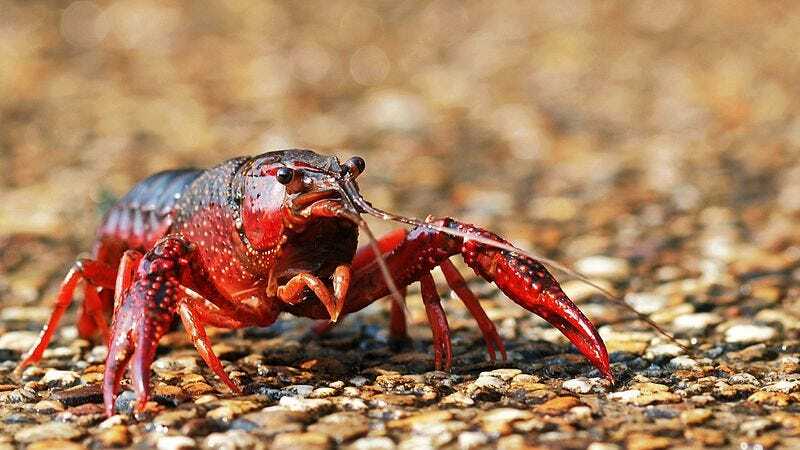 The tunnels may or may not have visible vents to the surface, so people can be walking over prime crayfish territory without knowing that the ground is full of tiny dirt lobsters. The only time they venture out is in spring, when temporary puddles and streams allow the female to raise the young above ground, and on very muggy nights, when they can catch the air without drying out.